As part of part two of our Digital Tools and Methodologies module, we were asked to take part in a crowdsourcing project of our choosing from the site Zooniverse or another relevant project. I decided to incorporate a crowd-sourced project that I had planned on being apart of as part of my assignment. 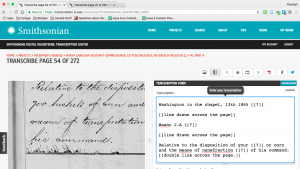 I went with the Transcribe-A-Thon of the Freedmen Bureau’s papers in honour of Frederick Douglass’ 200th birthday. A group for the event was organised by Dr. Donna Alexander and Dr. Orla Murphy as a joint effort, in our very own Digital Humanities room in UCC. 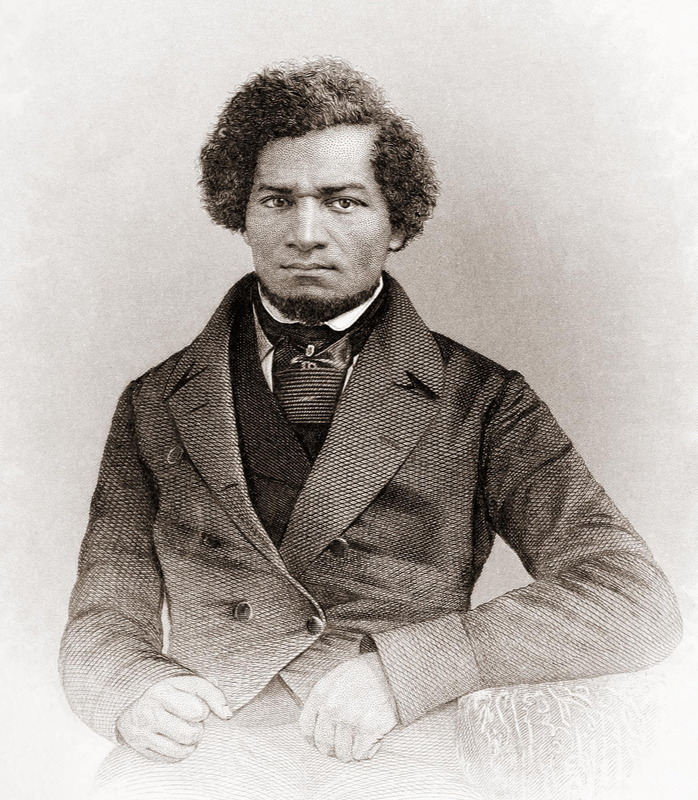 For those who don’t know, Frederick Douglass was a former slave who became one of the main voices in the Abolitionist movement, attending various marches and speaking at rallies about his time as a slave when he was younger. I had the pleasure of reading Douglass’ first book, “The Narrative of the Life of Frederick Douglass”, last semester as part of my English minor. Douglass himself, came to Ireland in 1845 to hold lectures in various parts of the country and often spoke, highly, about his time in Ireland in later life. 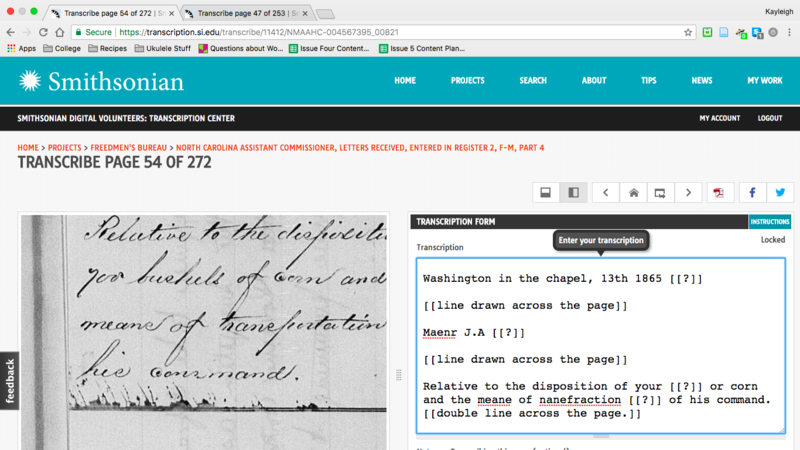 As part of the Transcribe-A-Thon we were asked to work on the Freedmen Bureaus Papers which were a collection of letters and documents pertaining to former slaves which the Freedmen’s Bureau tried to help. These letters hold a lot of information about that time in the US so it was crucial to do the best work possible during the event. 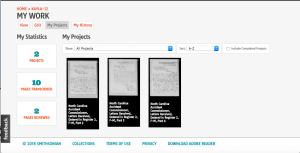 The event, itself, was organised by the Smithsonian Transcription Centre where the Freedmen’s Bureau papers, along with other collections, are held. The reasoning behind the campaign was not only to get these important documents transcribed but also to get more people involved in the Transcription Centre itself as a Digital Volunteer. Everyone involved had to sign up for an account as a Digital Volunteer for the event and this was how we accessed the documents on the day. 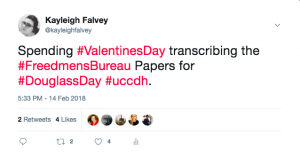 This was a simple process, like with any social sites today and was very easy to access and to find the documents you were tasked to transcribe. The website, itself, was very easy to use and we were provided hard-copies of documents from the site which provided helpful hints and tips for transcribing the documents. There was also a Facebook Livestream which was on hand to give more information about Douglass himself and the era that we were dealing with. The Smithsonian also had Digital Volunteers on there Twitter answering questions from people taking part in the Transcribe-A-Thon. 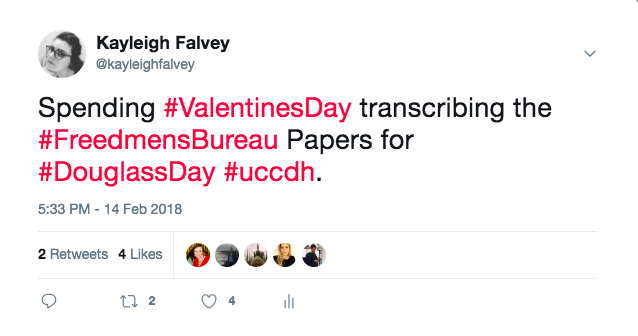 Although I was a complete beginner to transcribing any kind of material so I was slightly nervous going into the project, but there was a lot of help given on the day both in the DH Space and online. However, I did feel like if you were going to try to work on this project at home without any support it may have been slightly overwhelming due to the sheer number of documents that needed to be transcribed but also the detail and the style of writing may have thrown some people; as it did me at the beginning. But like most things, once you got used to the cursive font of the hand-writing and often the blurred look of the pages, transcribing became enjoyable and I genuinely did not realise how much time had passed while I was working on my pages. One very helpful hint that was mentioned a lot throughout the event, both online and in the room, was to try reviewing completed pages so that we grow used to the writing style and what was expected of us to do when we transcribed for ourselves. Another thing that made the task more enjoyable was the sense of teamwork and community that was felt during and after the event. One downside to the event was that it was often time-consuming going through the pages and finding one that wasn’t already in use by another volunteer. Perhaps it might have been easier for them to assign a specific selection of the papers to the groups instead of the ‘free-for-all’ situation that happened halfway through the event. However this did not hinder people too much but for me it would have made things slightly more time effective for the event. Perhaps in the future they will take this into account as I’m sure there will be similar events in the future following the success of this one. 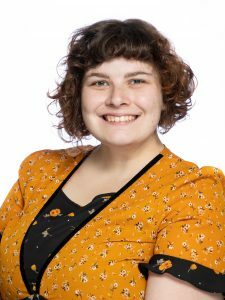 Overall, I learned a great deal from doing this project, not only as a Digital Humanities student but as a student of English and I will be looking into taking part in more transcription projects when I can. Doing this project has also made me think about the use of crowd-sourcing as a way to complete projects and how it can have its positives and its negatives. For example, the Smithsonian Transcription Centre said that they had a huge increase in people signing up to by a Digital Volunteer for the project, which is amazing but I wonder in a months time, how many of these accounts will still be active, in use and working on other projects that the Centre has to offer. Another negative could be that, how many of the pages that were transcribed, actually were transcribed correctly and can be added to the database without any issue. There was a large amount of volunteers on the day and I assume that many of them did not have a huge amount of knowledge and experience in transcribing documents. Because of this errors could have occurred and I would be concerned that the documents were not as well transcribed as they could be. Even though I am doing the Work Experience route of my course so I won’t be going into my final year until 2019, the idea of doing a Final Year Project is something I constantly think about throughout my studies. And now after doing this assignment, I am more certain that my project will incorporate a crowd-sourcing element in some capacity. Even though I am not 100% certain on what my project will consist of, I know that I will apply the skills that I have learned doing this project as I found the process of transcription really interesting and I intend to use the skills again in the future in my internship where I will be working in an Archive for the next academic year. Doing this event also helped me to realise that I enjoy doing transcription work, I had an idea that I would enjoy this kind of work but I wanted to give this a go to give it a try as I was so sure that I wanted to go into Social Media work, now, however I can see myself doing more of this work as I find it really interesting and I can really see myself using my English minor to pursue this kind of career. As I am studying Women in Literature this semester, we have discussed the problem with the erasure of women’s literature during the Renaissance, one way I could see to apply the transcription skills would be to track down letters and notes that women writers wrote during that time and perhaps put a story together to illustrate that yes, there were women writers at that time but we do not hear about them as they have been erased from history due to social norms of the time. For me this is one of the reasons why crowd-sourcing projects are so important today as not one person has the whole story anymore and in order to people like us in Digital Humanities to get the full stories we need to reach out to others and help to put the pieces together so that the jigsaw, that is our history, is complete. And I for one will be happy to help to tell the stories of the past so that scholars who look to find information on female writers or even on Frederick Douglass will not hit a blank wall like so many before them.